We specialize in manufacturing a wide array of DIP molded terminal battery caps for various industrial and domestic appliances. All of these moulded terminal battery caps are manufactured using the superior quality DIP moulded plastics which ensure high tensile strength and resistance from general wear and tear. We are successfully satisfying the varied requirements of many industrial clients through our flawless range of products. We 'Positive Plastics Pvt. 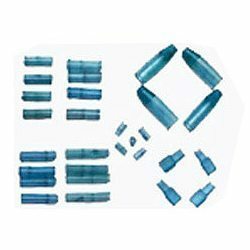 Ltd.', located at Noida, Uttar Pradesh, have emerged as a well recognized Manufacturer and Supplier of superior quality DIP Molded and Injection Molded Plastic Products. Our range of flawless plastic mouldings and plastic products are widely used in various industrial applications like automobile, telecommunication, electrical and engineering, etc. We initiated our business operations two decades back, under the able leadership of Mr. Rajneesh Raghuyal and ever since then, we are successfully catering to the various industrial and engineering needs of numerous industries with our unmatched product range. Further our expertise in manufacturing these moulded plastic products enabled us to gain the certification of ISO 9001:2008. The state-of-the-art infrastructure supports us to manufacture quality components, thus meeting our varied clients' requirements. The efficient team and management policies of our company continuously helps us to lead in this competitive business market.